If we were having coffee today I’d be in a confessional mood. Yes, I’d admit, I’ve been feeding the neighbor’s chickens. There is a hole in the fence and for quite a while a few chickens and guinea fowl have been getting out. They wander into our yard all the time. I’ve never had much experience with chickens. A couple of them had been lurking really close to the house and a couple of months ago I decided to haphazardly throw out some birdseed. Big mistake. The primary culprit is a big Rhode Island Red rooster we call Pepe. If I go outside or if I talk to somebody outside or if I return in the car, I can expect Pepe to come running; really, he RUNS. He knows ME. He usually has a couple of his girlfriends in tow, we call them Beatrice and Henrietta. “What kind?” I was asked. “I have no idea,” I answered. The clerk looked at me like I was insane. Maybe I am. I bought the smallest bag of feed I could, twenty-five pounds. It’s filled in pretty good. Some days we have had as many as four or five chickens and maybe a stray guinea. I could see him in my rear-view mirror, standing in the driveway and plotting. When we returned a couple of hours later we could see them. Yes, them. Pepe had been talking and the word was obviously out. My neighbor’s side yard was full of ducks. They were lounging near his carport, some were roosting on his carport roof and even the roof of the house. Now understand, we see his ducks from time to time. Mother ducks often come waddling through our yard, cute ducklings in tow on some sort of field trip. Never have we seen anything like this. And the second I pulled up the driveway they started moving into our yard. When I first saw them all in total and saw them begin to move, the opening bars of the Ride of the Valkyries started rolling through my mind. I wish I had a video of it because the music would have been a perfect backdrop, especially when the ducks started soaring off the roofs. And yes, from some unseen corner, here came Pepe and the girls too, sprinting over as usual. When all of them finally made the long waddle I counted twenty-two ducks, plus the chickens. Obviously, we have bitten off more than we can chew. I mean, we don’t feed them a lot. It’s not a meal by any means, more of a snack. My neighbor doesn’t care. They eat bugs in our yard too. I usually pick up a tick or two every month but I haven’t had a tick all summer. There are no birds in the novels. If we were having coffee today I’d have to beg forgiveness again because, well … I just have to give an update about the shoes. 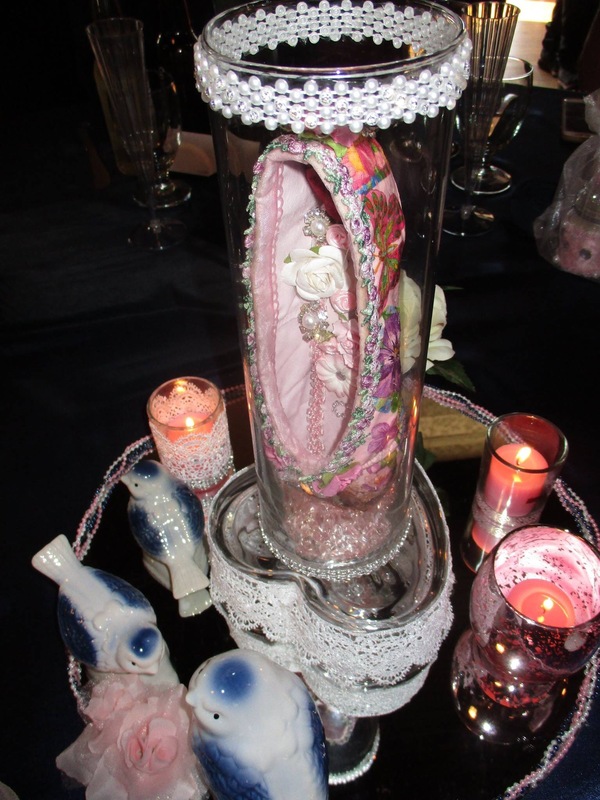 I first mentioned the shoes last June, while they were still in the process of being transformed into the showpiece/centerpieces for our daughter’s upcoming nuptials. To recap, Gretchen, my darling bride, took our daughter’s sweat-stained, ragged, worn-out pointe shoes, remnants from many years of intense dancing, and proceeded to turn them into works of art. 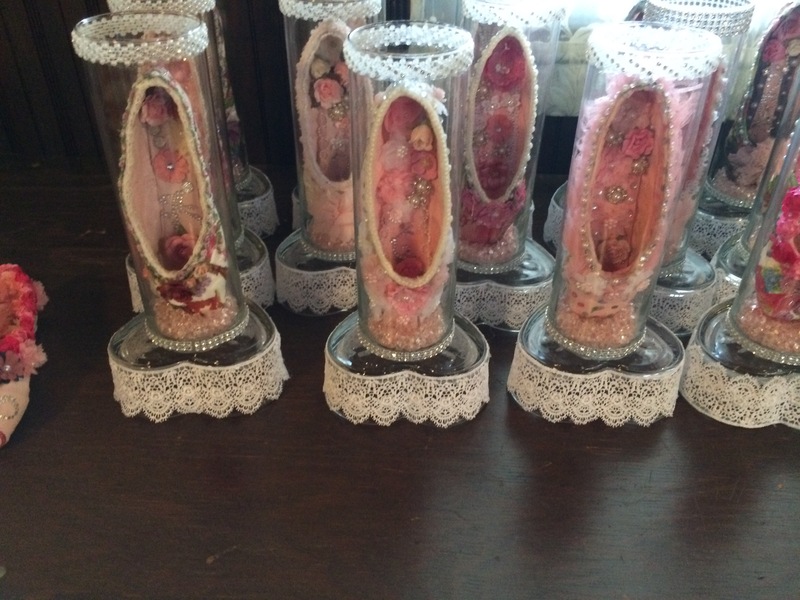 To this end she used paint, decoupage, glue-on gems and flowers, and all manner of arts and crafty add-ons. 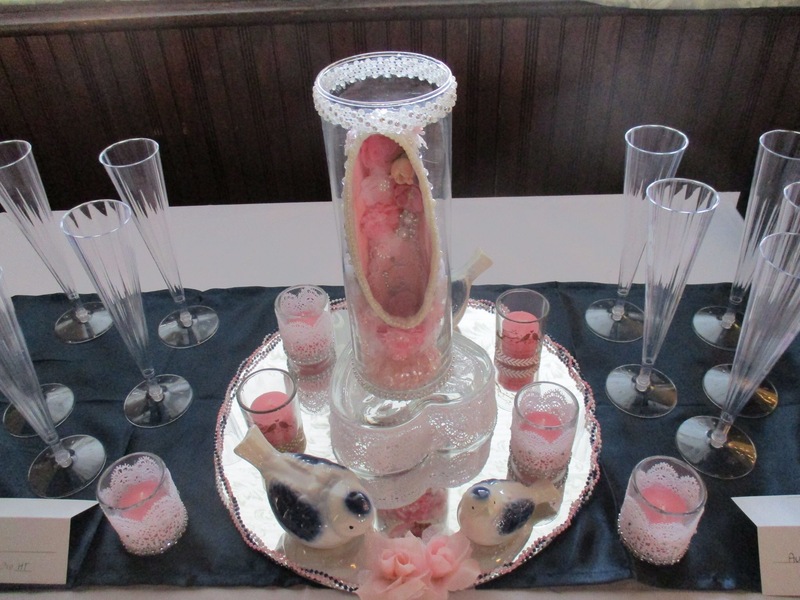 She created about twenty unique pieces for this wedding. When the florist delivered the bouquets and boutonnieres he mentioned to me that no centerpiece flowers were ordered and I showed him what we had instead … he was impressed. Anyway, as you can see from the pictures, after she finished decorating all the shoes, the plan was to display them in a tall glass vase. After looking them over, she decided a little height was necessary, so each vase was elevated with an inverted glass heart dish. A dab of lace around the dish, a round table mirror, a little decorative border and a few additional accents completed the centerpiece … I think it was a marvelous and unique idea and I am not alone. In looking at facebook postings of wedding pictures, everybody included multiple shots of different shoes. The glass dishes were a little unstable as a platform and this required a late-breaking modification … we glued them, and very late at that, so we were quite fearful of the glue curing in a timely fashion. It made for tricky transportation because I did not feel safe boxing them … so I put them on the floorboard of the two cars we were driving with a little light padding around them … and tried not to take any sharp turns during the 170 mile trip to the venue. All arrived intact. Like most wedding preparations, these shoes were just one of many details. It’s April Fool’s Day and I’m fessing up … I did play a little joke on my readers and now, finally, the truth will come out. This is about character names. Names are always tough for a writer. My old creative writing professor at the University of Houston, Mr. Karchmer, always chastised us for worrying too much about names. Everybody did it, and looking around at a lot of the current deluge of writers, everybody still does it. His point: they are just names, concentrate on the story. I know writers who get baby books for ideas, and there are online guides for “most popular names” for given years. All good stuff. I have an unpublished completed draft where the main character is Tucker Bailey … those are the names of two of my cats. For my novel, The Fever, I decided to have a little fun. I spent way too much time on this too because it was a lot harder than I imagined it would be. When I started planning the novel, although I had already worked out most of the major plot elements in my head, I needed a number of good character names. I got an idea. What about … anagrams? So I experimented with a few choice phrases that had some bearing on the plot. A few of them were zero … I don’t remember exactly what I tried at first … but then I tried lostgoldmine. I used an online anagram generator for this and got a wide range of what looked like usable words. I had to ignore the words lost, mine and gold along with combinations that included those words because they was too obvious (for example, golden and mein). I poured over the lengthy list pulling out what I hoped were suitable names worthy of the characters I imagined. Sometimes I found I could combine items on the list into viable names that didn’t appear directly in the list. Through quite a number of revisions, all the names remained intact but down the line, as I solicited input from test readers, about ¾ of them hated my main character’s name … his first name was Milt. It was too bad, too, because I kinda liked old Milt. Another character had a name that was really just too similar to another character … that was Midge. So in later revisions I changed them both to more accessible names. But a majority of the other character names survived intact: Smidgeon Toll, Loot Meldings, Godson Millet, Ted “Slim” Longo, Gillet Osmond .. even a place name made the cut, Dolings Motel. All should be anagrams of lost gold mine (barring a typo in this hasty blog entry). I also added another small similar touch … Loot Meldings lived at 4653 Tesoro Rd … using a phone numberpad anagram, 4653=GOLD and of course Tesoro is Spanish for treasure. I also have a confession … on two stray pages, I messed up and called Milt Mitch. Of course when I did a global search and replace to change Milt to Sam, those references to “Mitch” were missed. Although I corrected it in the publisher galleys, somehow that change did not make it into the Amazon kindle edition … and after MONTHS, I am still trying to get them to upload the fix. Nook, iBook, print editions are all good but the Amazon problem persists. The question, “Who the hell is Mitch” has been directed to me a number of times. Anyway, please forgive me my bit of fun. I think it worked out okay. This is Ashley’s own story, reblogged from her blog AshleysHeartJourney. My pal Albert Jefferies, aka AlJ, is out of surgery and in recovery. Bear in mind that although heart transplants seem very routine and commonplace, it is major surgery. But AlJ is young and he has a great team working around the clock to give him excellent care. And his mom, Tina … Let me tell you, if I ever have some trouble I want her fighting on my side. The force is strong with this one. Just remember, AlJ and his family will continue to need your prayers and support. I’ve shared about Albert Jefferies … aka AlJ … and his long wait for a new heart. Today we have some hopeful news. day 99!!!!! THE HEART IS HERE , TRANSPLANT WILL BE DONE TODAY !!!! I agree, keep AlJ in your thoughts and prayers. I’m giving away two kindle copies of my novel , The Fever. I think one has already gone so one left. Go for it. Follow me on Twitter. My cat Cookie is relieved! I finally decided to go with my own domain. Sadly, thomasfenske-dot-com was already in use. No, seriously, it was. Kudos to you, thomas fenske, wherever you are. Then I thought about my long-time handle, thefensk … it is a user name, it is an email handle, it is even my twitter handle … why not use it as a unique and catchy domain name? So, thefensk.com was born. I think Cookie approves. In case you were wondering, my name is pronounced Fence-key … but going way back some people seemed to call me Fensk … not that I liked it, but I tolerated it. in the early days of the internet (I’ve been on it since long before Al Gore ever heard of it) I could easily use fenske as a username. But there are more of us than you might think and it wasn’t long before variations were needed. It is not a common name but it is not rare either. Once, on some site, “thefensk” was one of the suggested usernames and I sort of liked the idea of it. 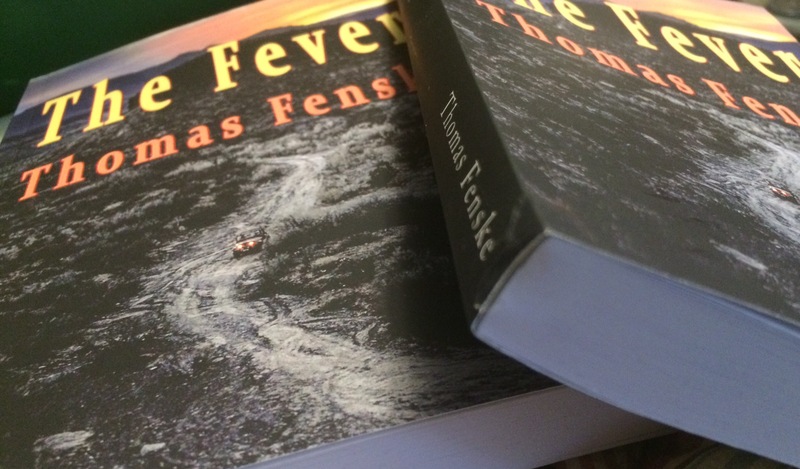 The suggestion came about, I’m sure, due to my first name and middle initial .. THomas E FENSKe … thefensk. I liked it. So there it is … same website (for now) but I will be updating it very soon. thefensk.com … www.thefensk.com … use whatever you want.